Ah, handwriting. Neither of my kids have the gift for good handwriting, and it takes effort and deliberation to go from big and sloppy to the neatly formed letters that I feel they need. Madison is a still reluctant when we do copywork in print, but she loves cursive. Something about it makes her feel adult, fancy, and it logically makes sense to her. Unfortunately, there isn't a lot of cursive material intended for younger students - it all seems to assume that most kids start cursive at the end of 3rd grade at the earliest. It made sense that we review New American Cursive I from Memoria Press. New American Cursive 1 is designed with the first grader in mind. This would mean Madison is actually a little old for this, but since she's still a beginner when it comes to cursive, she started here happily. Unnecessary strokes are eliminated - the alphabet has 26 fewere strokes than most cursive methods. Letter forms are simplified, but retain the classic form. The slant is slighter - it's not vertical, which is tiring and slows down writing - but it makes it easier for righties AND lefties. The slant used is a nice balance. The program itself was created to be simple, clear, and effective. The focus is on accuracy and legibility. The included teaching guide suggests lessons that should take twenty minutes a day for practice in the book. 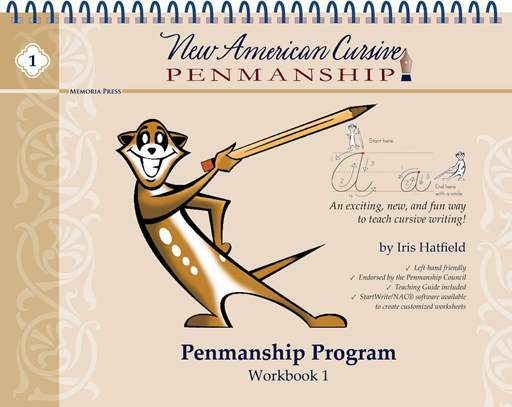 New American Cursive 1 features the character, Mr. Meerkat, As the book’s guide, he makes learning tasks fun; step by step, he shows the way to draw each letter and encourages creativity. There are clear arrow directions for letter creation, and plenty of shaded letters to trace for practice. Madison loved Mr. Meerkat, and loved the chance to color him in, and draw along with some of the pages. She loved that language too - helping the letters hold hands, climbing and sliding, even ending with a smile! I will say that Madison, at the end of second grade, but still seven, did love this, but the language is definitely for younger students. An older beginner might not love it quite as much and need something else to get them started. I'll probably start Reagan on this next year as well, along with her print copywork, and it would be right at her level as a first grader. Memoria Press has several more books in the New American Cursive series. 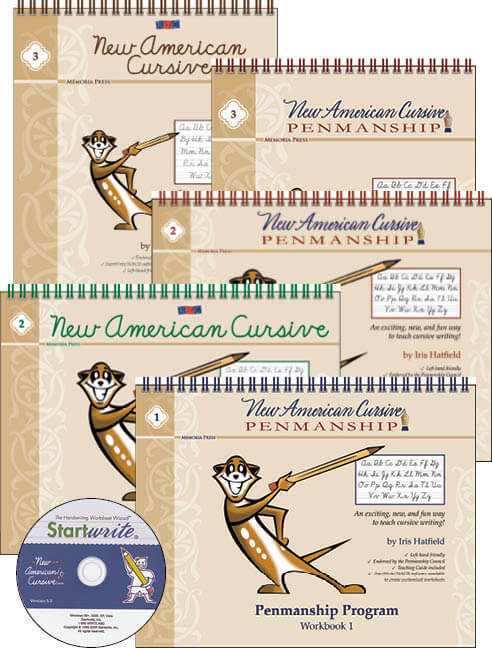 There is New American Cursive 2 (Famous Americans), New American Cursive 2 (Scripture), New American Cursive 3 (Scripture & Lessons on Manners), New American Cursive 3 (Famous Quotes & Lessons on Manners). They also have StartWrite software, for using the NAC alphabet to make customized sheets for spelling words, name practice, and other extensions. I will definitely be getting this once we finish the book, since I think that the best way to practice handwriting is to write things you need to learn! Honestly, I'm having a hard time holding myself off from grabbing this right away, and I wish I'd gotten a chance to check this out along with the book! I need this software in our homeschool.